Hearts Never Change – Imminent! The third and final part of Richard Liveth Yet is in the review process by Amazon Kindle and should be available to purchase and download by the end of the weekend!! I know many of you have been waiting for it, so I have used the provisional cover, but you can download any updated versions later. I hope you will let me know what you think of it and please be sure to leave a review on Amazon or Good Reads! The third part of the trilogy is in the final stages of uploading, formatting, etc, and the cover is coming along. I thought you might like a sneak preview of it – I did promise you Richard III as never seen before….well, here he is! Thanks to my sister, Lynne, who helped to manipulate the images. This isn’t the final version, but it will be along these lines. Please let me know what you think! Richard and Rose can see what seems like the whole of the earth from the top of the Norwegian mountain, Nårkampen. As I love the track, Earth, by Hans Zimmer, which was part of the soundtrack to Gladiator, I used it as the title for this scene – it’s so peaceful as the Norwegian mountains are. Richard and Rose are enjoying relaxing with Torstein in Norway and they spend some time exploring the beautiful Norwegian countryside, climbing a small mountain called Nårkampen. This beautiful song, Mountains, by Lonestar, is perfect for this scene. Click the link to see the video. Here is a photo of Nårkampen. Read more of Richard’s and Rose’s adventures in Richard Liveth Yet, available to order in print or download. 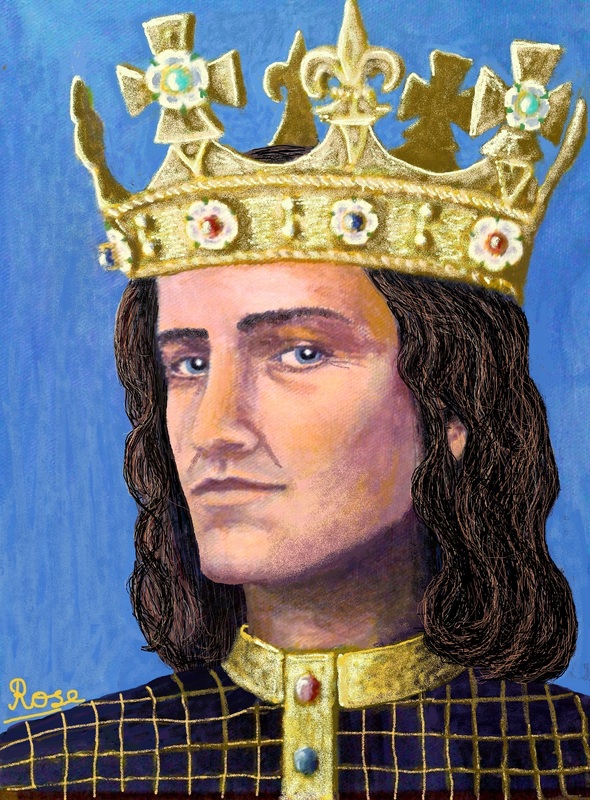 Richard is still a king, even though he is in modern times, and he still sometimes acts as one. He has a certain ‘look’ which can silence almost anyone! I thought the song ‘That Thing You Do‘, from the film of the same name starring Tom Hanks, was a great title for this scene – see why Richard resorts to ‘the look’ by downloading Richard Liveth Yet on Kindle for just 99p until May 31st! It’s a Kindle Countdown offer! Rose and Richard arrive in Norway to meet Rose’s friend, Torstein. Richard likes the landscape there as it reminds him of Yorkshire in his own time, and he finds Norwegian houses and cabins to be comfortable, warm and light – and made of Norwegian Wood. It is one of my favourite Beatles’ songs. Richard is depressed, so Rose decides a holiday might help and they travel to Norway on a ‘plane; Richard’s first flight! Will he be afraid, nervous, excited? I decided that the E.T Flying Theme by John Williams could be best used to illustrate this scene. Find out all about their trip by downloading Richard Liveth Yet or ordering a print copy. ‘Richard Liveth Yet’ on You Tube! I would like to thank Ian Churchward of The Legendary Ten Seconds for creating a lovely promotional video with scenes and characters from the book, all set to his fabulous song, also called ‘Richard Liveth Yet‘, taken from their third album of music about Richard III, appropriately called ‘Richard III‘. If you like folk-rock (reminiscent of Rick Wakeman in places), history, Richard III and especially if you like all three – give it a listen!